1. Preheat the oven to my favorite temperature – 350 degrees. Place the Brussels sprouts in a Ziploc bag and add some olive oil (I used about a teaspoon per half-pound of sprouts) and sprinkle with salt and pepper. Seal up the bag and squish everything together. 2. Spread the oiled-up veggies on a foil-lined baking sheet (first picture). Bake for 30 minutes. 4. When the sprouts are done, sprinkle with bacon and toss with a teaspoon or so of maple syrup. Mmmmm! Yes, this formerly scary veggie was helped out mucho with bacon and maple (two of my favorite flavors, by the way!). But I admit that these tasted REALLY good, and not just compared to other veggies (bleh). So much so that I might make this a regular dish – easy and delicious! Any other brussel-phobes out there? I love brussel sprouts, but I didn't love them until I had them fresh. I've also learned that boiling them is bad! Much better to roast them or saute them. One of my go to brussel sprout recipes includes taking the leaves off, sauteeing them in olive oil, then mixing in some toasted walnuts and finishing with lemon juice – very light and refreshing! Sounds delicious! Brussel sprouts are one of my favorite veggies, though I also absolutely hated them growing up. They have to be done right, and it looks like you totally succeeded! Yum. I've always hated brussel sprouts until i had them shaved within a salad, with pecorino cheese and a little olive oil and balsamic dressing at fav Houston restaurant Dolce Vita, if you are ever in these neck of the woods you must try! I need to try brussel sprouts again. I haven't had them since I was a kid when I thought they were gross too. I'm sure I would think differently now, I just haven't had the guts to buy them yet. But, if a former (can I say former?) veggie hater is singing their praises perhaps I should give them another try. ooh I should try this. I hate brussel sprouts so much but I desperately want to like them. It must be a reverse psychology thing. Thanks for the Brussels sprouts shout out. Brussels sprouts have a bad rap. They're teeny tiny cabbages! I've always been tempted to add bacon fat to my brussels but have held off due to the veggie/health cancelling effect. Maybe next time when I'm indulging myself. LOL. Everything is better with bacon and maple, right? 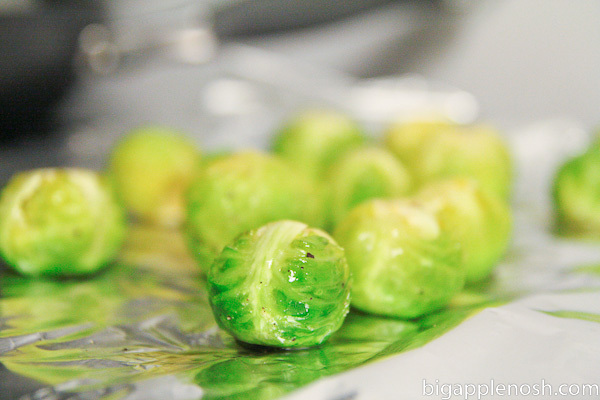 These look yummy – I haven't tried brussel sprouts for quite some time, but may need to give them another shot. As others have said, I think bacon makes anything taste better. I love brussels. Had them last night in fact. But if there were bacon in the dish . . . that would have been amazing. Hold on a sec, I'm allowed to combine maple syrup, bacon and brussel sprouts?! Sold. Yum. I think I saw Alton Brown making something similar and this combo just sounds divine! I love your photography..very interesting recipe, but looks wonderful! 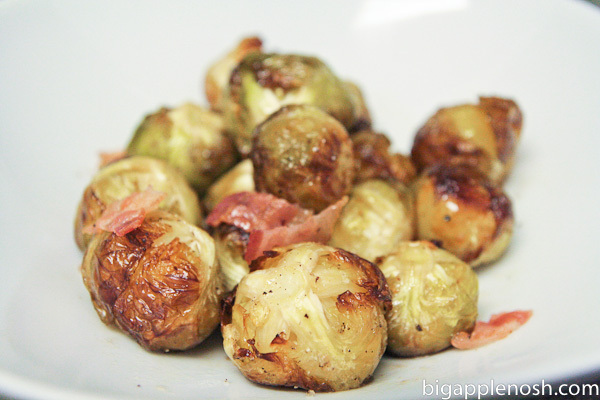 Thanks for posting about brussel sprouts! They are one of my top 3 favorite veggies! And one of Charlie's top 10. I love brussel sprouts. Only learned how to eat them last year. I cooked it over the weekend. A friend was here to join us for lunch. When it was served on the table, he turned to my daughter and whispered, 'It's my NO.1 enemy!'…..haha. But he has no choice cos I didn't cook any other vegetables. Ive never tried brussel sprouts! 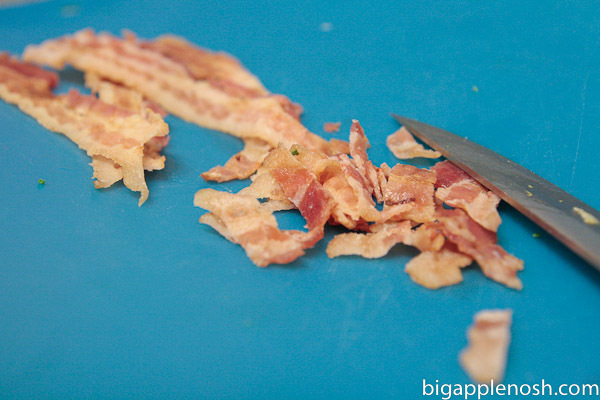 But this is def a way I might try…with bacon and maple, you may have changed many minds about them! My other fav ways to have them (1-3 times a week I just a pound of brussels sprouts for lunch, haha): pan-roasted with smoked paprika and coriander, or shredded and sauteed with butter, garlic, onions, and grainy mustard and then tossed with pasta (or spaetzle! ), walnuts and parmesan. Really really delicious!